NEW CONCORD, Ohio -- The No. 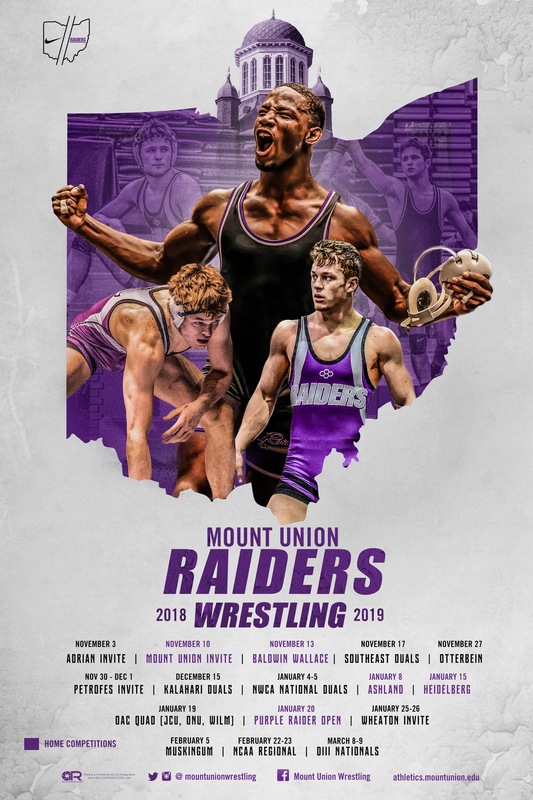 7 ranked Mount Union wrestling team finished up the dual match portion of the 2018-19 season with a 43-9 win at Muskingum in an Ohio Athletic Conference match Tuesday at the Anne Steele Center. The Purple Raiders won four of the six contested matches to go 17-3 overall and undefeated in the OAC at 6-0 in dual meets this season while Muskingum is winless at 0-11 overall and 0-6 in the OAC. Mount Union junior Connor Homan (Loveland) picked up his 15th pin of the season at 174 pounds while senior Rob Valenti (Hilliard / Hilliard Darby) got a pin at 184 pounds. Sophomore Luke Hernandez (Nashport / Tri-Valley) got a major decision win at 149 while fellow sophomore Michael McIntire (Wadsworth / Akron St. Vincent-St. Mary) nabbed a win at 149 pounds as the Raiders other two wins. Mount Union will next compete at the NCAA Central Regional Feb. 22-23 at Wabash College in Crawfordsville, Ind.